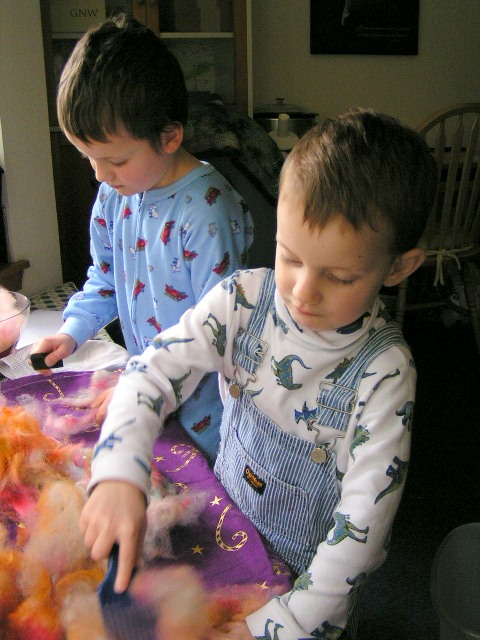 Nikolai and Gabriel teasing alpaca fleece to prepare for carding. We start ’em young around here! Firstly, thank you all for all the wonderful comments you left about the “Amazing Tri-Cable Sweater.” Thank you for the new name Peggy. Several of you commented on the fit, so if you’re curious- I blocked the chest to 34 inches. My bust measurement over undergarments and a thin t-shirt is 31 inches. So 3 inches of positive ease. I’ve noticed with the Knitting Daily Sweater Galleries how many people like seeing the ways sweaters look of different sized folks and using it for a reference point, so I think I’ll start doing that here too. Second, On the topic of the Shawl Collar Sweater. Jeanne wondered whether I would publish the design? Well, I hdan’t really thought about it, is there much interest? 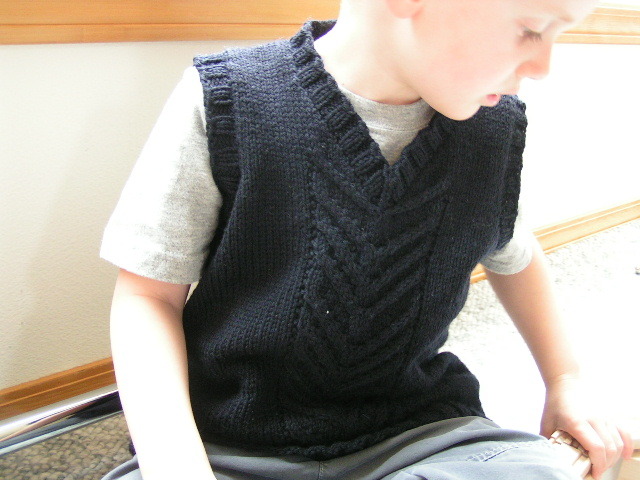 I have been thinking of putting up a shaping/steeking/shawl collar overview with lots of progress and process pictures. Essentially I would be giving you the recipe EZ style so you can design something made for you. Is anyone interested in something like that? Please let me know what you’d find most helpful. 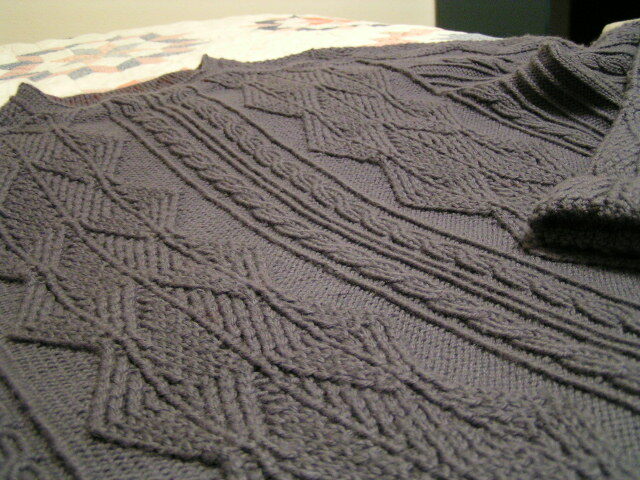 Third, I’ve started the Gathered Pullover from the Winter 2007 IK. Yarn is Berroco Ultra Alpaca Light. That’s a pretty accurate color. When I first started knitting this I thought I wanted it to be loose, like wearing a cloud, so I’m knitting on 8s and getting 4.25 sts/in. Later I went on Ravelry and noticed that the versions with negative ease looked the best (IMHO). So that’s why it’s off the needles in this picture. I measured it and it came out only 30 inches around the cable pattern so this might work out. For now it’s back on the needles awaiting judgement. Perhaps size can be corrected with some aggressive washing, but I kinda want to just start over now. Opinions? What number are we on? Spinning. It’s a start. I’m still learning. Currently on the wheel is more fiber from Peggy, this time some Wensleydale. When I first started spinning this stuff I was drafting a really fine strand, so I used the smaller whorl on the flyer. But as I went along I started making it thicker and the smaller whorl was too much. On the far left you can see the softer strand produced when I went up to the larger whorl with thicker drafting. Hopefully I can correct the overspinning problem. The finish of some projects is rather anti-climactic. Some projects are highly gratifying. Some make me grin like an idiot. Pattern: The Seamless Saddle Shoulder Fishtrap Aran by Elizabeth Zimmermann, pattern and design input gleaned from Knitter’s Almanac and Knitting Workshop, both by Elizabeth Zimmermann. 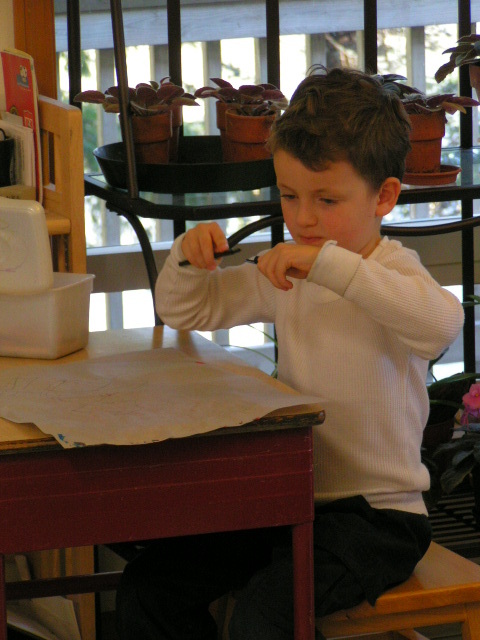 Time Frame: Planning commenced September 17, 2007. Yarn received and knitting begun end of September. Knitting finished November 8, 2007, finishing finished November 27, 2007. Yarn: KnitPicks Swish DK, 100% Superwash Merino Wool, color Mist. 17 skeins / 850 gms / 2091 yds. This is all I had left, and a pretty accurate color. Hems were knitted with sock yarn leftovers held double. Needles and Gauge: US sz. 5 / 3.75 mm needles – 16″ for sleeves and neck, 24″ and 32″ for body. 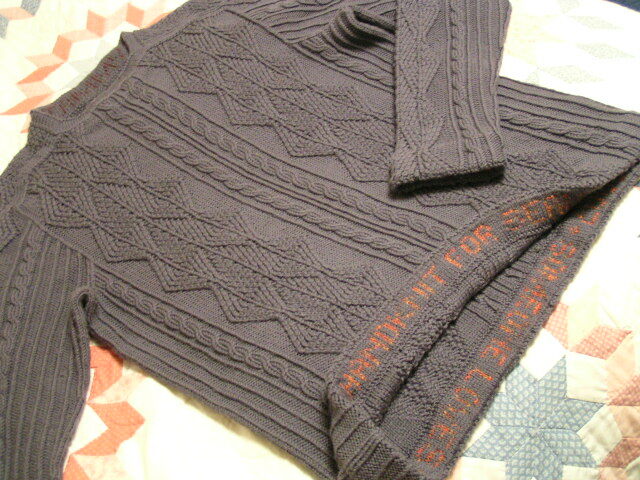 Hems were knitted on US sz. 4 / 3.50 mm. Gauge over stockinette with larger needles was 5.5 sts per inch. 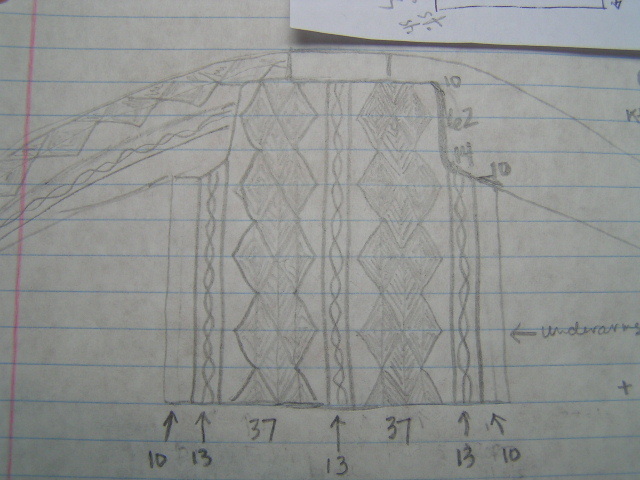 What I did: First, I sketched, and planned, and used my calculator a lot. When the yarn arrived I started the first sleeve as a swatch. My gauge was drastically different than my planning so after refigureing the proportions and pattern placement I knit both sleeves and body up to the armpits. After assembling all the pieces I started normal Saddle Shoulder shaping as laid out in Knitting Workshop. 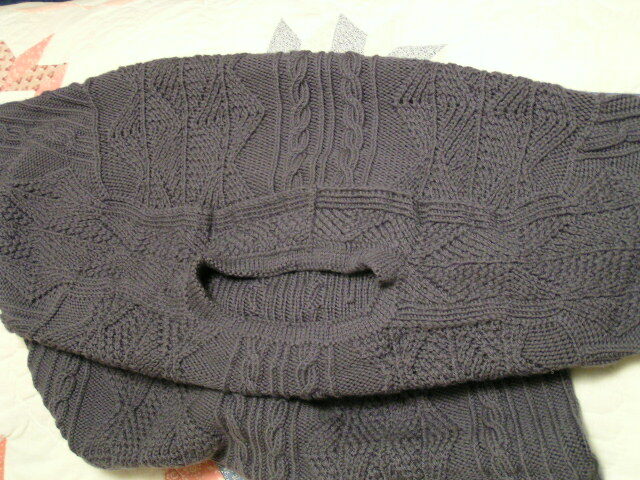 Both saddles were knit longer than the original EZ design, because I had way too many stitches to start the neck. My original plan for the neck was to knit a third saddle raising the neck-back, as directed by EZ. As you may have read, it did not turn out quite how I’d hoped. Aside from the problems with fit, I just didn’t like the way this looked. This neck shaping looks fine in stockinette, but cutting up the patterns and continuing only half just didn’t float my boat. That was ripped. I went back to EZ’s seamless neck shapings and decided to try a modified version of her shirt-back yoke. In this version, the saddles are continued all the way across the neck-back and grafted together. The saddles EZ used for that design were much wider, but this worked just fine too. 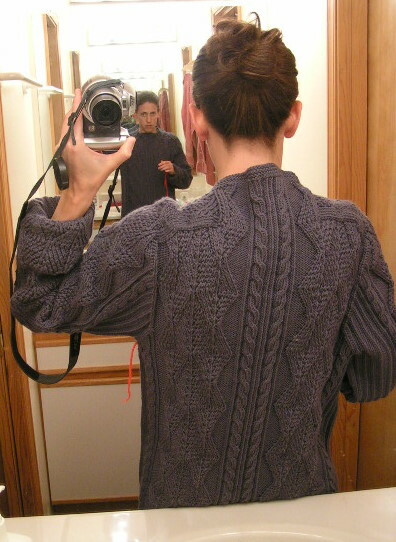 There is still some flare and puckering due to gauge differences between the saddle and the body of the sweater, but it smooths out beautifully on a person. I opted to join the 2 saddles with a crocheted slip stitch, thinking to create a ridge of Vs as a nice design element. If you are more experienced that me you probably know this is the same as an inside out three-needle-bind-off. It’s ok, but if I was to go back I’d probably graft the 2 saddles instead. This is a bird’s eye view of how the yoke comes together. The Neck: After picking up stitches from the sides of the saddles I purled one round, decreasing strategically to make the transistion smooth. Then I knit a few rounds plain – the only plain knitting on this thing – then purled another round decreasing to 90% for the neck hem. Which brings us to hems. 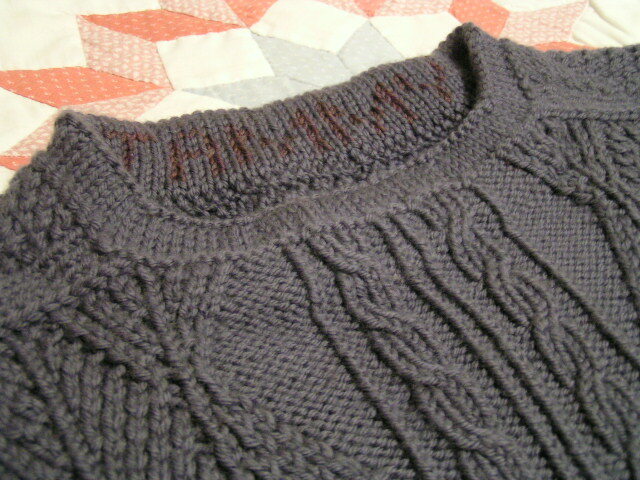 The neck hem was continued from the purled round. 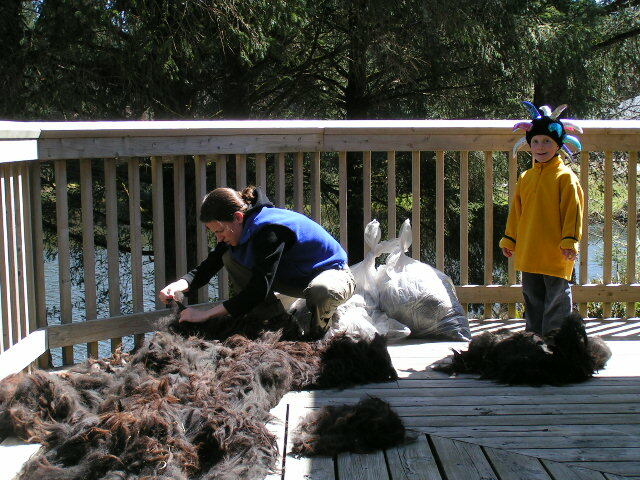 Body and sleeves were cast on using the crochet cast-on on 90% of the target starting point, hems were knitted afterward on the resulting live stitches. My good friend asked me to make this sweater for her husband, as a Christmas gift, to match their twin sons’ Fishtrap sweaters. 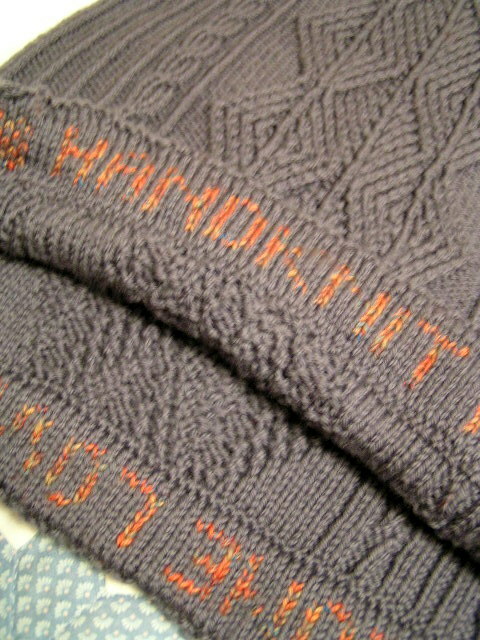 The bottom hem says: Handknit for Sean – Christmas 2007 – Someone Loves You. The names of their twins were knitted into the cuff hems, and the wife’s name into the neck hem. Things to do differently next time: If there is ever a next time I would use a much sturdier wool, Merino has a too short a staple for something this heavily textured, I’m worried this is going to pill like crazy. 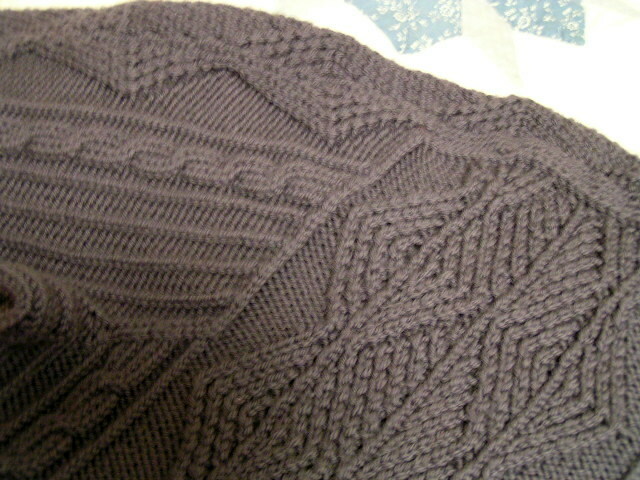 I was adamant about knitting this with wool, and my friend was adamant about it being soft and throwing it in the wash. 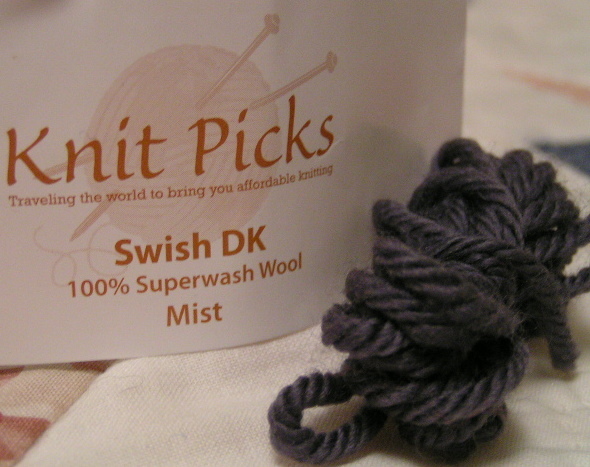 The superwash from KnitPicks was a good (and cheap) compromise, but next time I’ll choose something stronger. Verdict: Fishtrap was a joy to knit. The design challenges were just that, challenges, not obstacles. 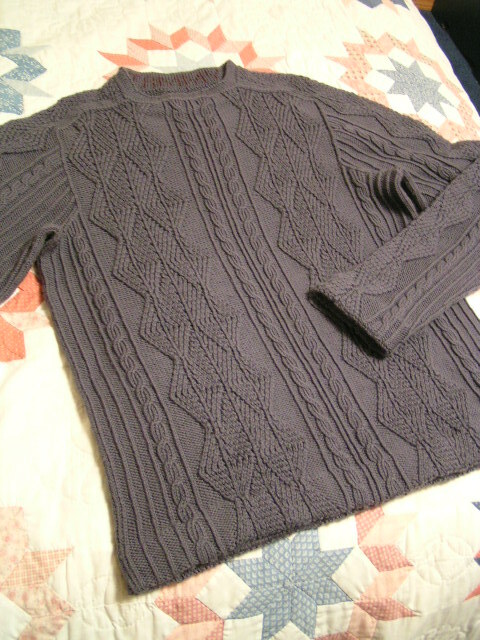 I will probably think twice about knitting another 48″ Aran, but it was still a good experience, and I learned a lot. I decided not to sign my name on the hem, but I couldn’t resist a little bragging. Hope you all had a wonderful turkey day, I’m stuffed. I have so many things to be thankful for, it’s overwhelming to stop and think about all the amazing parts of my life that are completely beyond my influence. All I can do is be grateful… and offer the occasional handknit or apple pie. And I’m thankful for my parents and the roof over our heads. 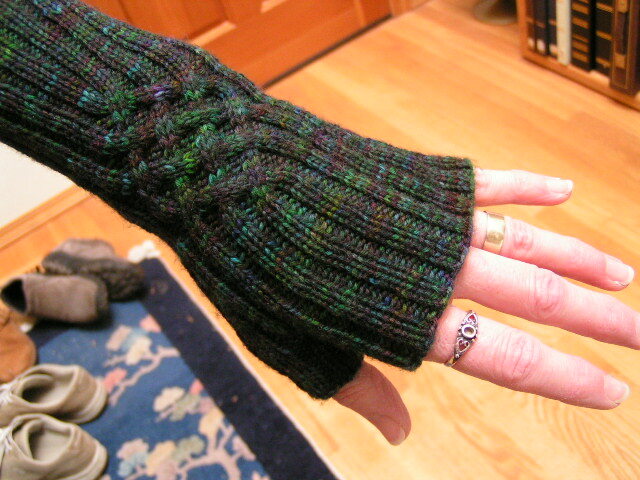 And I hope that my frosty-fingered mother is thankful to have a knitter in the house. 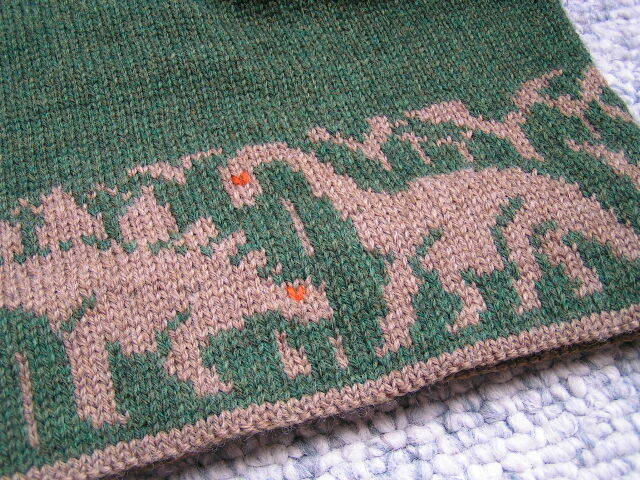 I’m finishing up the second mitt right now, and I’ll give you more info about them soon. 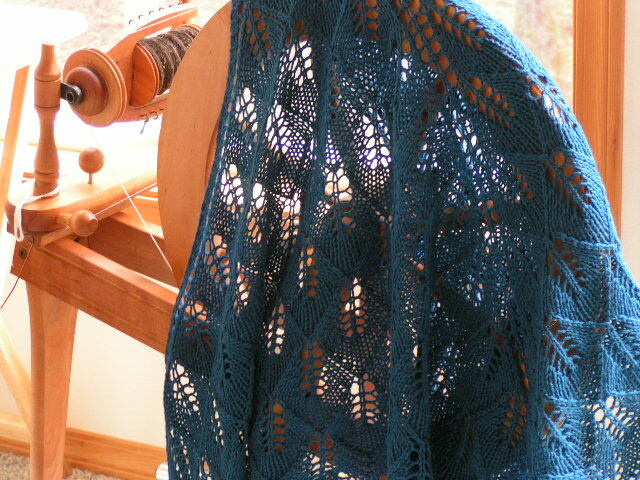 But if you can’t wait, here is the Ravelry page, or the pattern is here, scroll down for English. Especially after knitting the neck three times! That sucker better be perfect! And it is. Front. Back. Saddles. Epaulets. The whole smack come out perfect. Praise be to the Knitting Gods, who certainly warrant their mead of praise for this project. This last pic was supposed to be sweater and not me, but I like it so I’m posting it too. This is how I look when I’m trying really hard not to skip with excitment. And now this very happy knitter will betake herself to bed and let Fishtrap continue drying in peace. Cheers! You know how when you have to do something, you just want to get it over with so you can stop thinking about it? But you just don’t want to actually work on it? Ok, maybe that’s just me. This is what happened while I was not working on Fishtrap. Both boys need socks. Their handdye socks are too small and 2 pirate socks got felted and one is missing. Don’t ask how these things happen. So they asked for new socks, we dyed yarn I let them choose the colors. That’s Nikolai’s on the left, Gabriel’s on the right. But I haven’t knit them because I was waiting for my new swift and ballwinder to arrive in the mail. It finally came yesterday. You can probably guess that I wound every hank in the stash. I thinking of caking the center pulls next. I now have so much more useful yarn. And my niece brought me a skein of mystery fashion yarn (Lion Homespun?) and asked for a hat. I dislike this stuff but she asked nicely and I have trouble refusing. So here’s most of the “Dairy Queen” Hat from EZ’s The Opinionated Knitter. I knit a sock. BTW, I still haven’t finished that darn ball of Tofutsies, and this is the 7th sock! But the best distraction of all? That dear sweet angel Gabriel just turned 3. 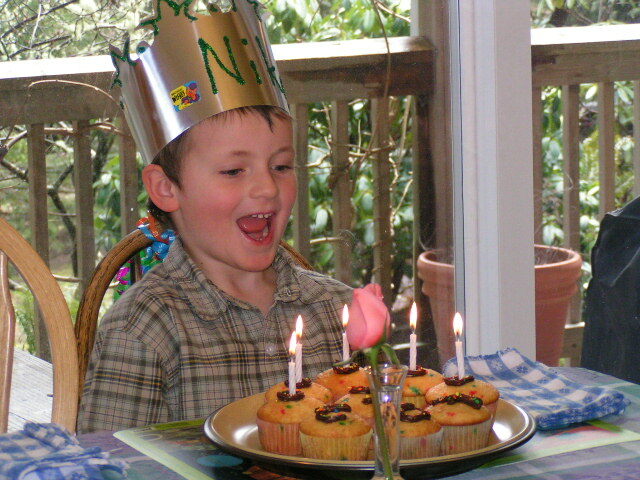 Happy Birthday little man.